Most of the ingredients in conventional bronzer will leave you feeling uncertain about its safety and whether putting the product all over your face is a good idea. Many of the ingredients pose risk to your body and can even give you cancer or affect your reproduction abilities – can we say yikes? SKIN-SOOTHING BOTANICALS - Formulated with only the safest, most gentle ingredients plus skin-soothing Aloe Vera. Gentle, natural ingredients make the Mineral Bronzer ideal for all skin types. COMPACT BRONZER - Lustrous, shimmering bronzer provide both beauty and convenience. Vibrant color blends seamlessly onto skin and lasts all day without caking or building up. Using many of the ingredients found in makeup and bronzer on a daily basis poses so much risk because they are absorbed directly into your bloodstream. Using toxic ingredients and chemicals is not worth the risk it poses to your body. It is important to seek natural, organic, and healthier alternatives. Luckily, there are plenty of clean options available. Parabens are ones of the most common preservatives found in makeup, including bronzer. Parabens are so harmful to the body because they can actually mimic estrogen, according to the FDA. This leads to an increase in breast cancer and skin cancer. Additionally, parabens have the ability to disrupt your endocrine system, leading to reproductive and developmental disorders. This is especially important for women of reproductive age looking to have children. There are many different kinds of parabens, so always keep a look out in the ingredient list. BHA and BHT is often found in bronzer as a preservative. They are a type of synthetic antioxidant and can cause cancers and negatively affect hormone function in the body. Exposure to these substances for an extended period of time have been linked to liver, kidney, and thyroid conditions in mice and can promote tumor growth in certain conditions. This is another ingredient that should be avoided when choosing a bronzer. Fragrance is where many companies like to hide an abundance of chemicals and artificial ingredients. Companies are not required to disclose what is included in the term “fragrance,” so they can put whatever they want into that category even if it is not related to fragrance at all. Additionally, most fragrances are stabilized with phthalates, which a chemical linked to reproductive issues and birth defects when tested on animals. This ingredient is found in many makeup items, even when they don’t really need this ingredient. SLS can cause major skin irritations, canker sores, damage to the eyes, and can cause bad acne around the mouth and the chin. If you find yourself breaking out is a red and/or bumpy, and painful rash around the mouth, chin, and eyes you may have an allergy to SLS. Typically this rash is very challenging to heal without proper treatment with medication from a dermatologist. The EWG Skin Deep website classifies SLS as “expected to be toxic or harmful” in organ system toxicity. SLS a chemical surfactant that makes soapy products, like face wash, foam. SLS can also be hidden in the ingredient list as sodium coco sulfate, which is still equally as harmful despite the fact it is derived from coconuts and not made artificially in a lab. SLS strips your face of its natural oils, which can make your face produce even more oil to combat the issue. Therefore, your skin will be dry, irritated, and your acne will likely be much worse. Next, you need to read the ingredient list. A fantastic rule of thumb to remember is if you cannot pronounce an ingredient or have no idea what the ingredient is, you may want to steer clear of that product. Often, a laundry list of ingredients is a red flag as well and all of those ingredients are unnecessary. Try and find a bronzer with as little ingredients as possible. Below are the 5 best natural and organic bronzers currently available for sale online. Each bronzer is completely natural, use organic ingredients when possible, and free of toxic ingredients. Your face will love them! Never any talc, nanoparticles, micronized particles, gluten, and so much more! Making up this simple bronzer is boron nitride, iron oxides, kaolin, zinc oxide, and rice powder – which is non-GMO and all particles are not micronized or nano-sized. 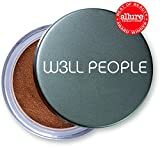 This bronzer goes on smoothly, looks completely natural, and won’t cause any uncomfortable skin irritation. 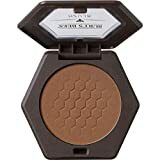 If you want a bronzer that is going to look very natural and that can blend into your skin much easier than some other options, this is going to be one of the best options for you. Plus, its clean ingredients make this a solid choice for all skin types and skin colors. We can never get enough of Rejuva Minerals and their bronzer is no exception. 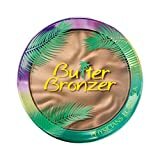 This bronzer has a silky smooth rich matte finish. Many bronzers can dry out the skin, but this will keep your skin looking hydrated and fresh. It won’t settle into your pores and fine lines and look too caked on. Of course, it is EWG verified and includes many certified organic ingredients like tapioca, jojoba, carnauba powder, and blueberry and grape! This is only made from simple and natural ingredients that you can actually pronounce and you can recognize what they are. This is one of the most important steps to finding a clean and healthy bronzer. If you want a warm, sunny looking glow from your bronzer, this is for you! 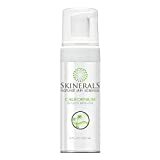 It is free from dangerous chemicals and toxins, uses many certified organic ingredients, and is always made without parabens, petroleum, propylene or butylene glycol, sodium lauryl sulfates, pesticides, phthalates, gluten, plastic or petroleum fillers, artificial dyes and synthetic fragrances. 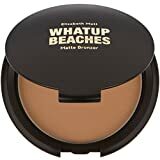 This bronzer will go on smoothly and is easily blended into your face on top of your favorite foundation. You also will not find any shimmer or sparkle in this bronzer, which many conventional bronzers include. This can leave your skin looking too unnatural and too shimmery, which many women do not want in their bronzer. You can always count on 100% Pure for many makeup that sounds almost like you could eat it (please don’t though!). This natural bronzer gets its pigment from cocoa powder, coffee, tomato, and berries. 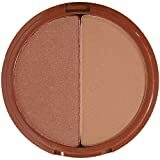 It has a subtle shimmer from light reflecting pigments and is full of healthy antioxidants and vitamins to help keep your skin glowing and healthy – even when you aren’t wearing this bronzer. Although this bronzer does have some shimmer in it, it is not going to look fake or make your skin too shimmery. This is one of the healthiest bronzers you can buy since all of the pigment in the bronzer is coming from fruits, veggies, and other food grade sources. This is often challenging to find in even natural and organic makeup brands, so you are getting something truly special with this foundation. With Allure and Elle Awards, this bronzer may be your new to-go product. It gives you a truly natural sun-kissed glow, corrects redness on the face, and provides dimension. Sometimes buying a natural and organic makeup product can be a hit or a miss because they don’t preform exactly the same as a conventional bronzer. But when you can find a healthy option that has also won a ton of awards, you really cannot go wrong. It’s formulated with 100% natural ingredients like green tea, chamomile, and aloe. There are absolutely no harsh chemicals, artificial preservatives, parabens, dyes, fragrances, silicones, dimethicone, pthalates, sulphates, petroleum, talc, bismuth oxychloride, and nanoparticles. We hope you love these bronzer options as much as we do! Each bronzer listed above has clean and organic ingredients, essential vitamins and minerals, and other healthy additives! It is important to keep toxic and chemical-laden makeup out of your beauty bad, and these bronzers will help you get started on the right track!